The C120 Strap Patio Chaise Lounge is the standard in commercial chaise lounges. The low body design, the extra support bracing, and the safety-rail headrest are all characteristics that make this lounge stand out among the crowd. The extruded aluminum body will not rust and may be powder-coated in any of our available frame finishes. The double-wrapped straps are made of 2 inch wide virgin vinyl that feature UV and mildew inhibitors. 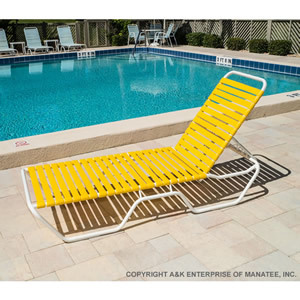 This patio chaise lounge stacks easily for storage and is the best value for a commercial grade outdoor chaise lounge.